January 9, 2019: IT’S NOT MY FAULT—IT’S NEUROBIOLOGICAL! 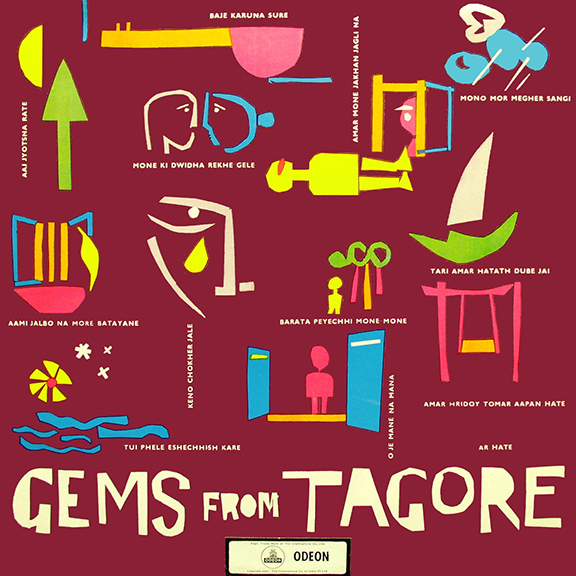 Since it says ODEON, I took "Gems from Tagore" to be a movie title or description, but IMDB wasn't much help. Wait a minute...is Odeon a record label too? album released on occasion of Tagore birth centenary in 1961. Sometimes music moves me in such a way that I find it hard to contain myself. But I will try. Oh, that Jaye Bartell, with an 'e'. I know one thing: HE DID IT. No one else did. Dani: Fixed. There was a prompt for both, accidentally entered the wrong one. Thx for catching. But then, I'm not familiar with the original. I liked it too, but I don't know if I've heard the orig. either. Maybe you should play it, Irwin? LL: I've overplayed the original. It's the BIG HIT for Broadcast. You've heard it, I'm positive. Singing on key s overrated. Got that right, Burmese land is like monkey land, not at all like Bermuda land. Any Trish Keenan/Broadcast is welcome. Album title = All Songs So Far. Hey when did I start getting Options? I've never had Options before have I? Or did I never notice it until today? Irwin, Micah yesterday played a great candidate for your next Songs in the Key of Z release: Gini Graham Scott's "Bankruptcy Blues". It was deliciously awful. Anyone else fired up for Dave Sewelson's new jazz show on Saturday afternoon on the Drummer stream? www.wfmu.org... The show debuts in a couple of weeks. I'm not familiar with this Jon Spencer album, am I wrong in assuming that this is the title track? Jon Spencer should be at least as famous as (fill in the blank) but is not. This sure took a turn. That's true -- and both appeared on this show twice! Afternoon. Have a little time so I thought I'd stop by for a bit. anyone going to the winter jazz festival marathon in nyc this weekend? I would if I didn't already have plans. Do I detect a Swan Dive in the vicinity? Hmm, if anyone is looking for a science fair project for their kid: Is it possible to determine how long a cup of coffee has been sitting out based on the progression of mold growth (color/pattern/%coverage)? Irwin - you're rather good @ this. I thought this might be Jane Siberry. I'm a believer in never heating coffee, once brewed. If it's left to just cool — slowly in an insulated vessel or not — it well taste fine 24 hours later. Best to refrigerate, of course. what made u play that Swan Dive track? What do they mean to you? I love Swan Dive and I'm pretty much the only FMU show that airs them. This is a musical injustice! I'm with you, Irwin. Swan Dive 4ever! fair answer. Do u know them personally? We've spoken, they have an open invite to play on this show. Why asking? Hello Irwin, Laura, Ken, and I like to think Fredericks is out there somewhere. Shovel-loads of praise for this show, Irwin. I'm enjoying this spunky music. Hi ya HJ--didn't I see a picture of you somewhere recently in front of one of the splendid Wegman murals at 23rd St. subway or am I dreaming I saw that somewhere? It seems their albums only get released in Japan and Korea, altho i only checked 2 albums. I just wondered why u played this obscure track from 1998 and why u picked it today of all days. Do they live in Asia? by the way, any odea what a breezeway is? Like a draught under a door? Yes Laura, it is my FB profile pic at the moment! Got such a kick when I saw those. I think E.S.T. likes Vince Guaraldi whom I think liked Bill Evans but how could I know. A breezeway is an enclosed passage between two buildings. Like between a house and a garage. Could you possibly play "Fight or Flight ..." off the new Kommode album? Same groove as this wonderful set. Eirik (of Kings of Convenience) will be visiting WFMU this April. It might also refer to unenclosed passages. US gov't. is currently shut down because the moron in chief wants to build a bulwark along the southern border. Could a bulwark do the same job as bollards? bollards are friendlier to pedestrians, i imagine. Bollards are bites en français. Mind the bite, mon ami. liked that lorkin fellow - google says he's now a poughkepsie boy. Great music! Always good to hear you, Irwin. Bollards are where you fast the line from your submarine after smuggling drugs across the Gulf of Mexico while laughing at the morons who think anybody's sneaking drugs across the un-bulwarked land border. Thot BlueCheer half a sec. Actually, a breezeway, as I know it, is a walkway with a roof over it. No walls, just poles holding up the roof. 'On the Knifedge'...probly simply that. prog archives says patrick moraz with the main dude in this - he ruined the moody blues with cheesy synth after mike pinder left. You must get yer keyboard tones right. This is good! But are you really allowed to play the non-German version of this song on WFMU? Isn't this a violation of your contract with Station Manager Ken? Bollards can eat the rich.Bulwarks starve the poor.Love David Bowie. What about Seu Jorge in Portuguese? Christmas pudding and ice-cream anyone? pie's good if you have any. or roasted brussels sprouts. I saw Moody Blues with Moraz. In a great Spinal Tap moment, his keyboards failed to open from the middle, door-like, for him to walk down with a synth axe for the big solo. He had to turn sideways and scoot his ample personage between them, all the while cursing at the roadies. ...so a breezeway extending from california to texas, along the border, wouldn't necessarily keep the bad guys in, er i mean out. No, but it would keep them nice and shady as they climbed the bulwarks. The Mainhorse track was an interesting one. Singer, organ sounded like Keith Emerson. Guitar work sounded like Jethro Tull. Never heard of the band, though..
carmichael -i saw them in 78 i think for the octave tour. with out a mellotron it seemed hollow sounding. i'll gladly allocate someone else's money for that; as long as we have concession stands along the whole length of it. Didn't George Carlin suggest putting up massive walls between factions in a police state & broadcasting their conflicts as entertainment? As remedial for the gene pool? katharsis can we do that? RR that sounds like an element in "1984" that Orwell just forgot to mention. You've always exposed me to excellent music Irwin. Your show is great. i know i paid for that hat, but i might "accidentally" forget about it there. I agree with Robin Eisgrau. Love your show, Irwin. s is this a mike nesmith cover or a linda ronstadt one? Those early Matthew Sweet albums with Quine and Lloyd were so good. oh dear lord, am i really hearing Duran Duran on WFMU? haha this is so bizarre! .or better. i can't tell. TWO OR THREE DIFFERENT KEYS SIMULTANEOUSLY! THIS IS EVIL GENIUS!!!! It’s not the wrong speed but what is it. Outtake? I'm favoriting the show solely on the basis of the Duran Duran track. Thank you Irwin! Wonder how this was done ... Traktor? Man, I gotta buy that software. When hackers start breaking into the autotune machines, expect a lot more like that. Is he a clean coal man? Just heard 'Hottest Stuff' on - some 'Ship Full of Bombs' podcast?? Nice to see people talking about Music!